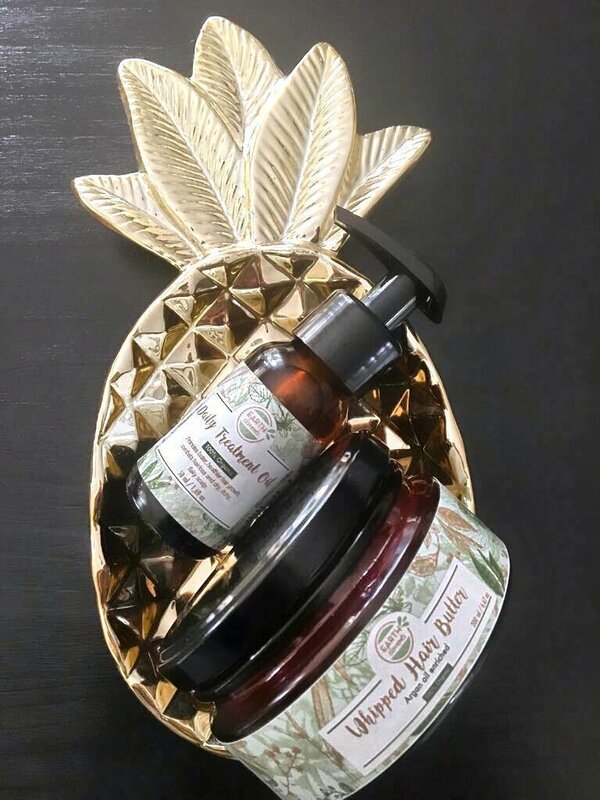 Our customers love this combination, it is a powerhouse of nutrients and minerals - our favorite combination for healthy hair and a healthy scalp. Suitable for all hair types that can be used in a variety of ways for healthy hair growth. The combo is especially beneficial to those transitioning from chemically processed to natural hair. Since the products are completely chemical-free, it is suitable for children when substituted with the kids treatment oil. The combo stimulates hair growth as a result of the increased blood circulation to the scalp. The nutrient rich combination helps with preventing hair loss and also other dandruff related problems. The high penetrative power of these amazing ingredients, won't leave any kind of stiffness or an unsightly residue on the surface of hair. And finally, the best benefit about this combo is how easy it makes detangling. A perfect detangler without that slippery feel. Argan oil makes hair softer, silkier and shinier. The ideal hair conditioner, and it helps to treat split ends and tame frizzy hair. Rich with vitamins A, C and E, and loaded with antioxidants, linoleic acid and omega-6 fatty acids. Avocado oil has numerous benefits for hair - the oil is highly humectant and emollient which means it draws moisture, and this is especially good for hair. A nutritious hair oil, avocado oil contains traces of B complex and iron, phosphorus, and a decent amount of ascorbic acid - a natural preservative. Avocado oil has the ability to deeply penetrate hair strands and provide a moisture-rich environment for hair. Jamaican Black castor oil contains omega-3 fatty and like ricinoleic fatty acids that are essential for good hair. Black castor oil moisturizes the hair, treats dry scalp and promotes hair growth. The healing qualities of black castor oil enhance blood circulation. Black castor oil can also be used to prevent hair fall and eliminate dandruff. Peppermint is an anti-fungal, anti-bacterial and anti-inflammatory essential oil that breaks down undesirable buildup and residue at the scalp and roots to promote healthy hair. Peppermint oil relieves a dry scalp, stimulate hair growth, and gives hair a healthy shine.